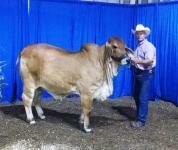 JH Ms Ruby Red 143/3 wins Jr. Division Champion at the 2014 Tennessee State Fair. 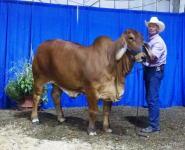 JH Genetics will be exhibiting Ms Ruby Red along with other cattle at the ABBA National Brahman show in Dallas, TX. Please stop by our booth. JH Ms Cover Girl 140/3 wins Reserve Jr.Champion at the 2014 Tennessee State Fair. 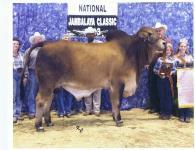 JH Genetics will be exhibiting Ms Cover Girl along with other cattle at the ABBA National Brahman show in Dallas. Please stop by our booth. Picture is of Harry with Mrs. Bess Neil. Mrs. Neil owns and operates Blythewood Farms in Cleveland, Tennessee and they are known for some of the best Saddlebred horses in the country. Mrs. Neil is a long time friend of Harry and she and her late husband were Harry's first employers when he was 16 years old training Saddlebred show horses for their family. This picture was taken June 2014 at a party hosted by Blythewood Farms for horse show exhibitors from across the country showing at the Chattanooga Charity Saddlebred Show. JH Genetics is proud to introduce Maybelle as the new Farm Mascot. 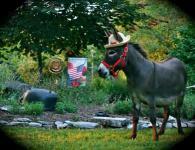 Maybelle is seen here celebrating the 4th of July.